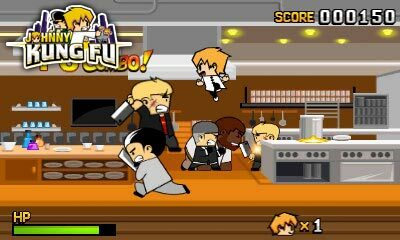 UFO Interactive Games announced Johnny Kung Fu for the Nintendo 3DS eShop. 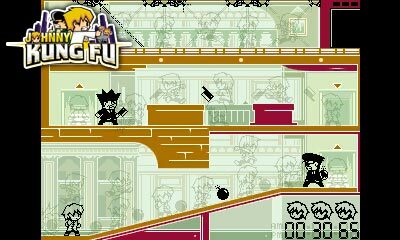 Johnny Kung Fu is an old school action game that mixes the old with the new! Designed and developed by UFO Interactive Games internally, Johnny Kung Fu puts you into the Kung Fu garb of a seemingly everyday man Johnny. The local organized crime group Mr. Wang, led by the mysterious man known as Mr. Wang, seems to have a bone to pick with Johnny and has captured his girlfriend Paula. Knowing that an ambush awaits him, Johnny chases the kidnappers into one of Mr. Wang’s hideout towers regardless. Will Johnny be able to save Paula? Or will the Mr. Wang Gang prevail? Johnny Kung Fu is set for release May of 2012. Developed and published by UFO Interactive Games, Inc.